Alexey Fyodorovich Tryoshnikov (Russian: Алексе́й Фёдорович Трёшников) (14 April 1914 in the village of Pavlovka, now in Baryshsky District, Ulyanovsk Oblast – 18 November 1991 at Saint Petersburg) was a Soviet polar explorer and leader of the 2nd Soviet Antarctic Expedition and the 13th Soviet Antarctic Expedition. He was involved in defending the Northern Sea Route during World War II and participated in the 1948 Soviet expedition to the North Pole. Between 1954 and 1955, he was the leader of the North Pole-3 ice station in the Arctic Ocean. He was also the president of the Geographical Society of the USSR since 1977 and the director of the Arctic and Antarctic Research Institute (AARI) of the Soviet Union from 1960 to 1981. In 1982 he was elected Academician of the Academy of Sciences of the USSR. A minor planet 3339 Treshnikov discovered by Czech astronomer Antonín Mrkos in 1978 is named after him. Medal "For the Defence of the Soviet Transarctic"
^ Lutz Schmadel (5 August 2003). Dictionary of Minor Planet Names. Springer Science & Business Media. p. 278. ISBN 978-3-540-00238-3. This biographical article about an Earth scientist is a stub. You can help Wikipedia by expanding it. Alexander Mikhailovich Prokhorov was an Australian-born Russian physicist known for his pioneering research on lasers and masers for which he shared the Nobel Prize in Physics in 1964 with Charles Hard Townes and Nikolay Basov. Boris Borisovich Piotrovsky was a Soviet Russian academician, historian-orientalist and archaeologist who studied the ancient civilizations of Urartu, Scythia, and Nubia. He is best known as a key figure in the study of the Urartian civilization of the southern Caucasus. From 1964 until his death, Piotrovsky was also Director of the Hermitage Museum in Saint Petersburg. Dmitry Sergeyevich Likhachov was a Russian medievalist, linguist, and concentration camp survivor. During his lifetime, Likhachov was considered the world's foremost scholar of the Old East Slavic language and its literature. Vasiliy Ivanovich Petrov was a senior Russian military official and Marshal of the Soviet Union. Elina Avraamovna Bystritskaya is a Soviet and Russian actress best known for her role of Axinia in Sergei Gerasimov's epic screening of Mikhail Sholokhov's novel And Quiet Flows the Don (1958). Nikolay Aleksandrovich Annenkov was the longest-lived People's Artist of the USSR before Igor Moiseyev and Vladimir Zeldin. Mikhail Mikhailovich Somov was a Soviet oceanologist, polar explorer, Doctor of Geographical Sciences (1954). Ivan Dmitrievich Papanin was a Soviet polar explorer, scientist, Counter Admiral, and twice Hero of the Soviet Union, who was awarded nine Orders of Lenin. Konstantin Ivanovich Beskov was a Soviet/Russian footballer and coach. Grigory Aleksandrovich Gamburtsev was a Soviet seismologist and academician from Saint Petersburg, Russia who worked in the area of seismometry and earthquake prediction. Gury Ivanovich Marchuk was a prominent Soviet and Russian scientist in the fields of computational mathematics, and physics of atmosphere. Academician ; the President of the USSR Academy of Sciences in 1986–1991. Among his notable prizes are the USSR State Prize (1979), Demidov Prize (2004), Lomonosov Gold Medal (2004). 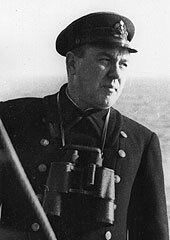 Lev Anatolevich Vladimirsky, was a Soviet naval officer and an Admiral (1954). Colonel Ilya Grigoryevich Starinov was a Soviet military officer. Ivan Fedorovich Ladyga was a Soviet-Russian colonel of artillery. He was a Candidate of Military Sciences, a professor, and a corresponding member of the Russian Military Sciences Academy. He was given the award of Honoured Worker of Higher Education of the Russian Federation, and a veteran of World War II Ladyga was one of the authors of the Soviet doctrine for using Strategic Missile Troops in combat. Born in 1920 in the village Manuylivka, USSR. The Jubilee Medal "Twenty Years of Victory in the Great Patriotic War 1941–1945" was a state commemorative medal of the Soviet Union established on May 7, 1965 by decree of the Presidium of the Supreme Soviet of the USSR to denote the twentieth anniversary of the Soviet victory over Nazi Germany in World War II. The Jubilee Medal "Thirty Years of Victory in the Great Patriotic War 1941–1945" was a state commemorative medal of the Soviet Union established on April 25, 1975 by decree of the Presidium of the Supreme Soviet of the USSR to denote the thirtieth anniversary of the Soviet victory over Nazi Germany in World War II.